costs a dollar for a life-time personal supply. that light-tight spray bottles are a convenient method of storing and applying silver-ion solution. Given the above, and considering its long history, its enormous range of modern research data and its huge advantage in simplicity and lack of side effects, it is surprising that no major effort has been made to expand the role of silver-ion solutions in human health. Silver-ion solution is at the threshold of reducing the spread of disease and human suffering. Here is an opportunity, and, we believe, a duty, for us to make an important contribution to improved human health and well-being. 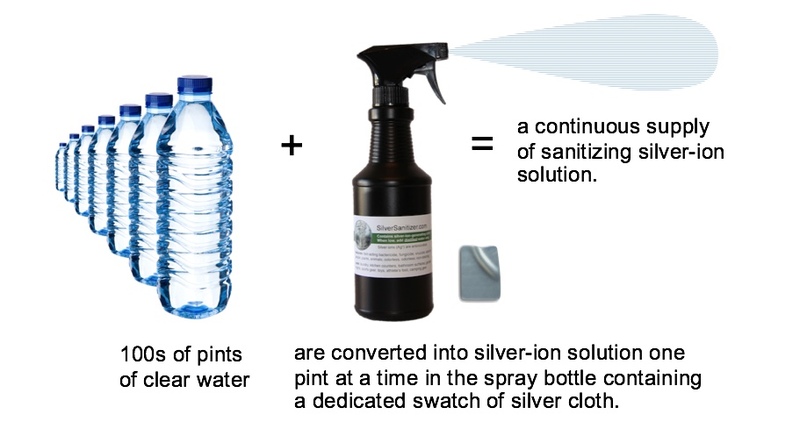 Our hope is that, by making 1) the materials needed, 2) the recipe for generating silver-ion solution and 3) illustrations of practical applications available here, this valuable sanitizer will become ubiquitous. The extraordinary will spread to become the ordinary. Our experience has shown that Balingen fabric is best. 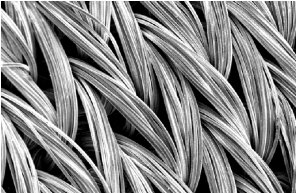 Each fiber of its knitted nylon yarn is plated with silver metal. Household and personal-size units are available at silversanitizer.com. Each makes 100s of refills upon addition of clean water. Quantity discounts and bulk supplies for developing countries are also available. 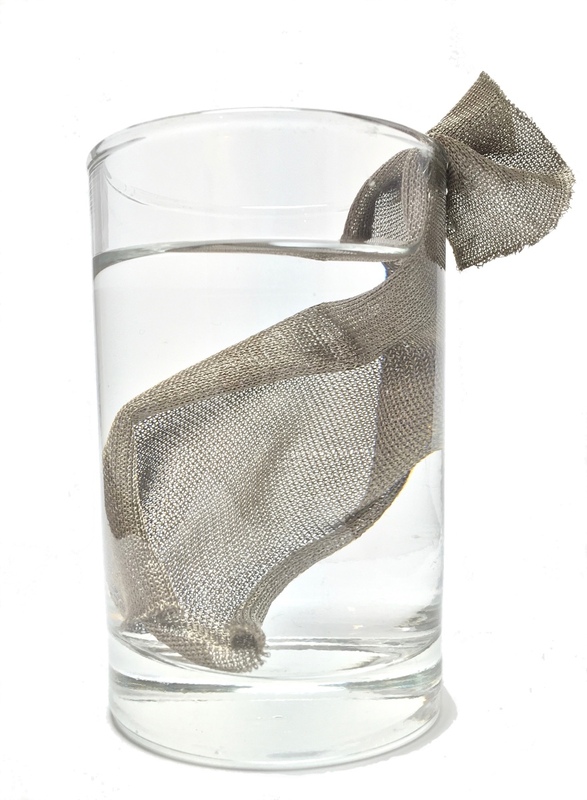 Silver, submerged in water, reacts with dissolved oxygen, forming a slightly-soluble silver-oxide film which dissolves and produces a dilute 1,500 ppb aqueous silver-ion solution. Because silver ions are released only from the wetted surface of silver metal, the rate of silver-ion release is directly proportional to silver’s wetted surface area. Increasing the surface area of silver (and thereby reducing its area cost) is accomplished by plating an extremely thin layer over a very large surface. In this way, we have increased the surface area of a one-ounce silver coin (five postage stamps) to that of a 6 ft. X 7 ft. wall (42 ft.2) – an efficiency boost of 1,300 times. 3) binding to microbial DNA and ending replication. 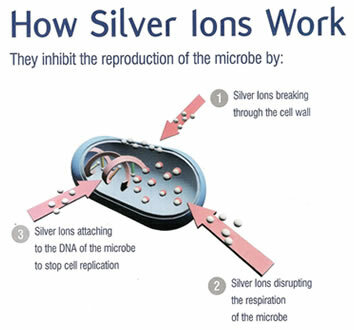 Silver Ions Kill Microbes by 3 Methods.